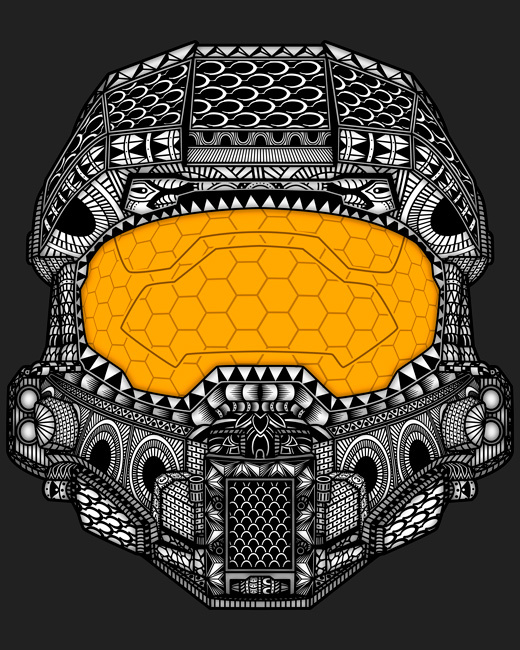 "The Chief" a pattern nightmare for a little tribute to Halo's Master Chief is now available as tshirt, posters covers and a lot of awsome stuff on Teepublic. So long since my last post but now i have finished my last job... at last. 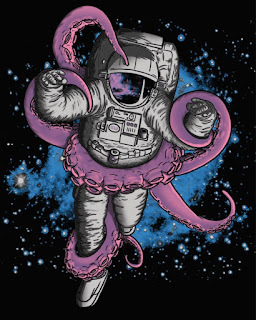 One of the topics that I like to draw about is undoubtedly the sci-fi theme and even more if I mix it with some nightmare and of course I love to put astronauts in delicate situations. 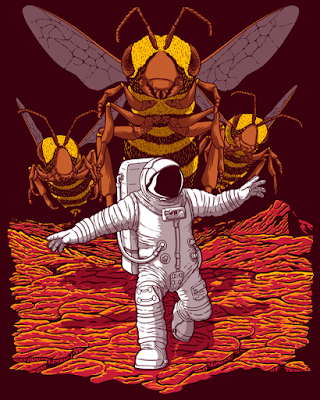 Now we have a brave space explorer pursued by a bunch of martianized killer bees. The kind of situation I would love to see in a B movie. Greetings from Scarif. A Rogue One 's beach troopers parody. Another parody about a Rogue One's scene inspired by the work from Kerne Erickson. 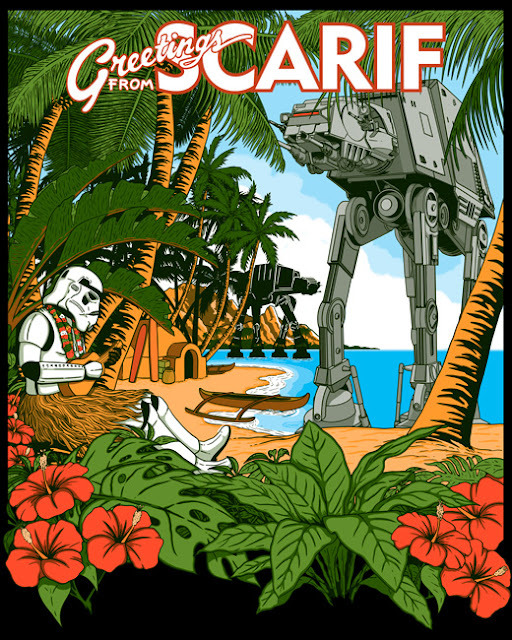 A travel poster from the paradise planet Scarif. From Hell. Luci / Hellboy mashup. 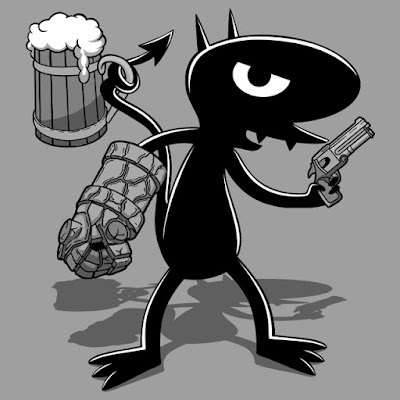 Luci is the personal demon that we would all like to have to brighten up life with his darkness. 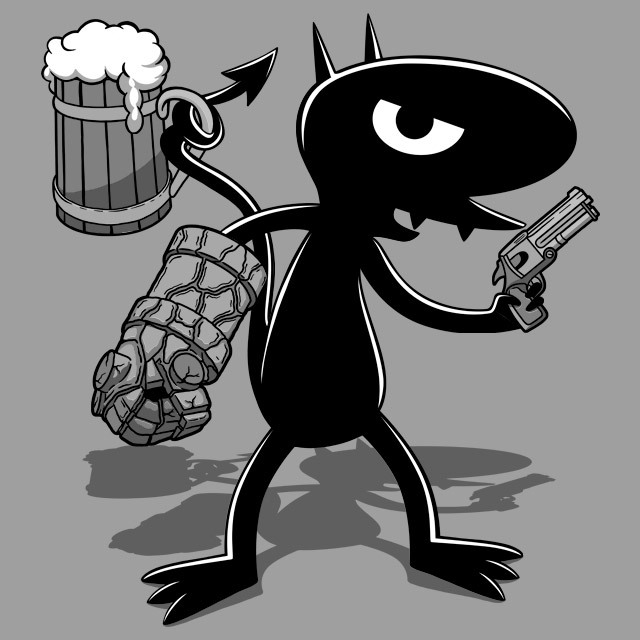 Here in a mashup with my other favourite demon. When the summer season arrives I always remember and, if I have the chance, I do a rewatch of Jaws, this jewel from the master Spielberg. I'm not sure if there is a creature in nature to wich the film studios have dedicated as many movies as the shark. I think that the public's fascination with this type of movies is basically due to not only the panic that a predator of this kind can cause but also some kind of atavistic fear of the sea, the great mass of water that we still do not know and that although it is a wonder itself can bring titanic horrors to our imagination. At his time, Jaws change our point of view about these animals and presented them as the cruel unstoppable killers, and the man as an useless and helpless piece of meat in a medium that is not our own and still insist on doing it our, spoliating it, messing it up and minimizing it. 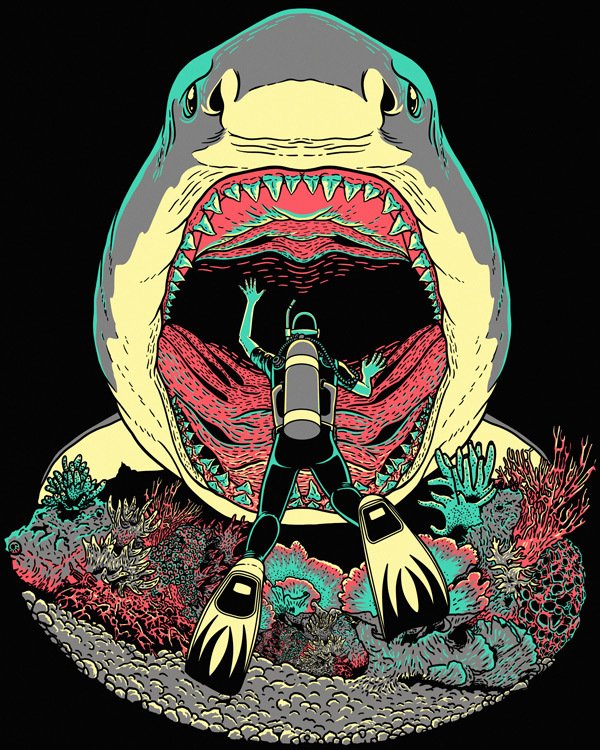 This illustration is a little tribute to all the shark movies. And remember to follow me on Instagram. Rebel plans and Imperial blueprints. This is a parody of one popular scene from the never ending galactic saga Star Wars. 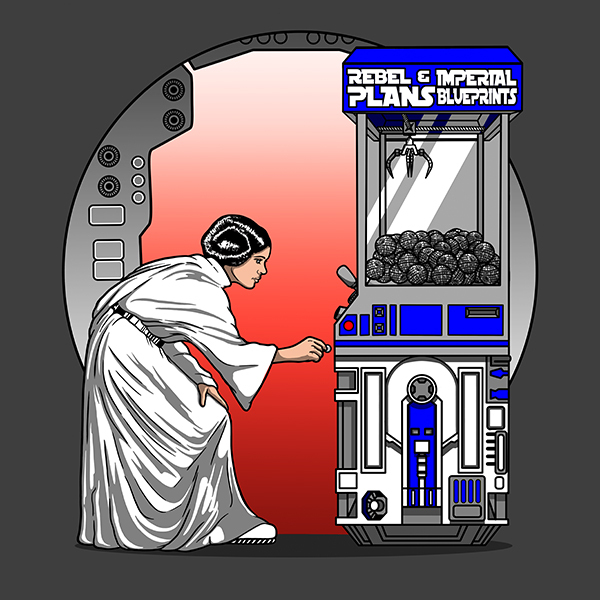 Yes, I know this would be a twist on the real plot on the movie but it seemed a bit crazy the fact that Leia get the Death Star blueprints from a R2 Claw Machine. Being honest and in view of the scripts for the saga, anyone would say that the Empire gave away their blueprints when buying a couple of cans of soda. Well, personal opinions aside, here you have this little joke. More jokes about the rebels dudes and imperial guys here, here, here and here. This began as an attempt to parody the poster from movie "The Princess Bride" but, as the story of the monster tells, things are not always as they should be. 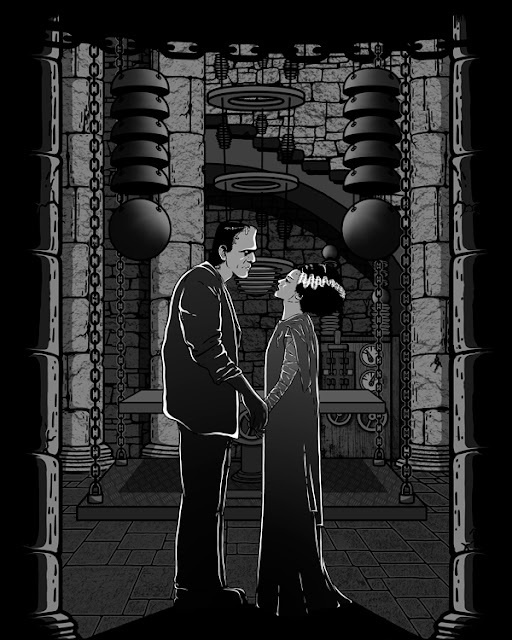 Consider it as an alternate ending for this classic horror movie about Frankenstein's monster. 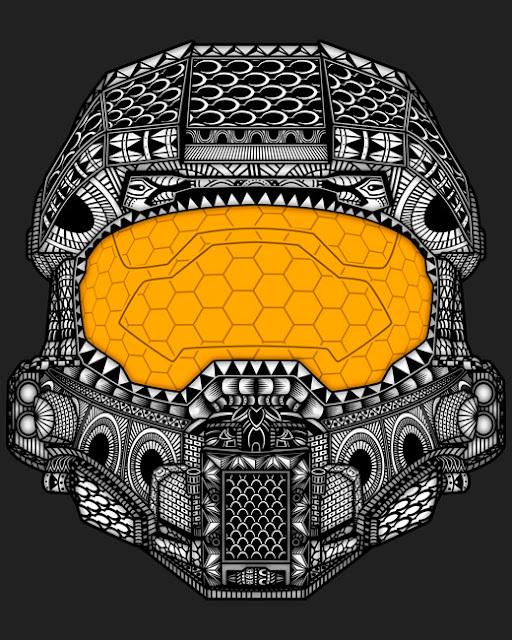 This design is available as awesome metal print on Displate and also as tshirt and other awesome stuff on Redbubble. The Atom Ant: behind the costume. Sugerencia de Guimor, aqui teneis mi versión. Si teneis alguna idea o quereis sugerir algun concepto... ya sabeis... comentad. Slashers and horror movie killers for coasters design.